When we live with cats, we owe it to them to become informed consumers. We need to learn all we can about their nutritional and emotional needs. But even more important, we need to learn about their health care needs because very few vets know as much about cats as we wish they did. Yes, they can diagnose illnesses and can usually come up with a satisfactory treatment plan. But compliance is often an issue with cats. 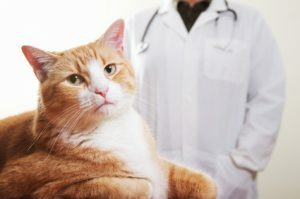 The vets often forget that cats are not small dogs with attitude and set unrealistic expectations for medicating cats. So it’s up to you to become an advocate for your cat’s health. Use the Internet to learn all the treatment options and discuss them with your vet. And make your wishes, and your cat’s, very clear to your vet. If he hates taking pills, tell your vet you need liquid medication. If he doesn’t like that either, and he’s on medication for life, insist that the vet become familiar with the gel you’d rub inside an ear tip and call in a prescription to a compounding pharmacy. Medi-Melts are another option for cats who are difficult to medicate. These tiny pills seem like treats to many cats. Capsules are difficult for cats to swallow because they get sticky when wet, so ask for an alternative. Also ask for an alternative to very large pills that need to be cut into pieces, forcing you to pill the cat several times in one sitting. If your cat is on several meds, you need to hide the taste of an especially bitter pill or decide to use capsules for another reason, invest in a good pill pusher that will get the capsule down the cat’s throat on the first try. Most dogs will gulp down a pill in some peanut butter or cheese. But cats aren’t so easy to trick, and vets sometimes need to be reminded that they’re not small dogs! If your cat doesn’t know your pet sitter well or if he’s difficult to medicate, ask the pet sitter to do a trial visit before you leave town. She should come when you’re not home to track down and reassure the cat. If she finds that she can’t medicate him without a lot of stress for both of them, he might be better off spending your vacation at the vet’s. If boarding is not an option and your cat is very shy, confine him to a comfortable, sunny room, and put barricades around anything he could hide under. The stress of being chased around his own house or dragged out from under a bed by a total stranger could offset all the benefits of the medicine.